Sometimes it take a week to process a race enough to blog about it. However, that's not what happened in this case. I left for the beach right after the race and am just now getting around to typing up a race report. Wet Dog is the only triathlon that I have done three years in a row. As such, it's a pretty good indicator of how much I've improved in the sport. 1:07, then 1:01, and this year 58:58. The biggest gains have been on the bike, but the run has gotten better too. Also, in the previous years I won the Athena category, and now I can no longer race Athena, so that's progress (I guess). It was a sketchy ride over to Decatur from Scottsboro, because my (relatively new) bike rack was disturbingly wobbly. Apparently the threads on the bolt that connect it to my hitch are already stripped, and that after only about 5 months of use. Luckily I made it with my beloved tri bike still attached to my car. Packet pick-up was not the most efficient I've ever been to, but it's a family friendly low-key kinda race so I just shrugged my shoulders and went along with it. Gregg Gelmis was already out and about taking fabulous photos as always, and I saw lots of Fleet Feet tri kits so I knew it was going to be a good day. I went for a little warm up bike to make sure my clips were working (still haunted by Frank Maples and having to race with only one foot clipped in) then a warm-up run. I was feeling physcially good but way too laid back mentally. I got transition set up, was careful to figure out where I was racked from the perspective of coming in from the swim, and totally forgot to do the same from the bike-in point. Yeah, no longer a rookie but still making rookie mistakes. I went into the water for a warm up, and then got out in time for the team photo. Yep, you heard that right: Kasandra Garner finally made a team photo. Mostly because they did it at the beach start instead of the finish line so that made it easy to remember. Also, as I mentioned before, I wasn't in that pre-race zone I usually get into about an hour before the race start that makes me forget about things like "team photos". I was way too far back on the swim. I probably put what my total swim time was last year instead of lying to get further up front. So my swim was ok but I had to swim over, under, and around people the whole time. 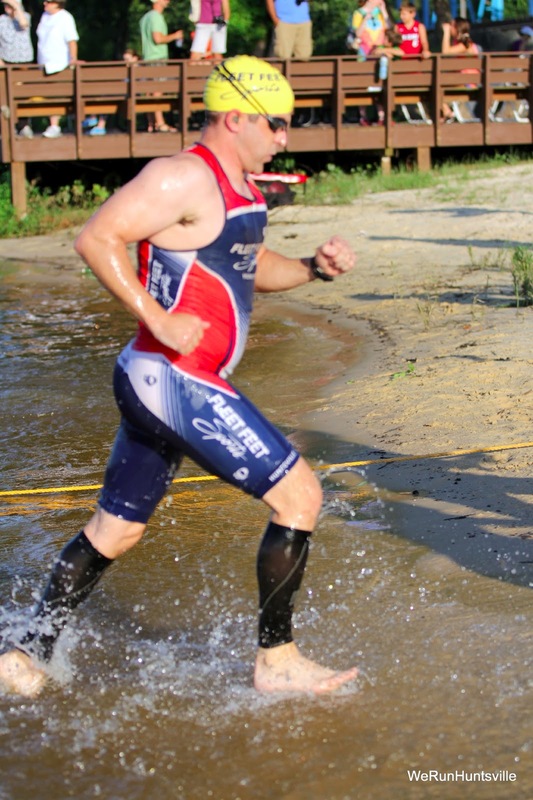 Then I came out of the water a little dizzy and had to take it easy on the jog to transition. I found my bike right away, and set out to see if I could hammer the bike a bit. I had a good bike leg, but because of there not being a bike dismount line I got slowed down coming into transition since myself and 5 other cyclists were all there at the same time trying to avoid each other and all choosing to dismount at different points. Then I started running my bike to my transition and realized I had no idea where it was, since I hadn't counted racks from this side. So I stood still for a few seconds, telling myself not to panic, and looked around until I saw my tri bag. Consequently it was a slow transition, and it cost me. But what really cost me was the run. I don't know if it was the heat, or the humidity, or my own mental weakness, but I could NOT make myself work the run. I would like to say that I had pushed the bike so hard that my run suffered, but I don't think that's the case. I could tell from my mental self-talk that I wasn't "feeling" it. Instead of pushing myself, I was already making excuses by the end of the first mile. I walked the water stops. On a 5k. I mean, really. Still, I finished in a respectable time and I did manage to improve over last year. There haven't been many races lately that I've finished thinking "I could have gone harder" but this was one of them. I hung around for a little while, ate a burger for breakfast, and then loaded my bike up (in the back of my car, NOT on the bike rack!) and headed for the beach to meet up with my family. So even mediocre race days can be pretty great if you are going to the beach afterwards! 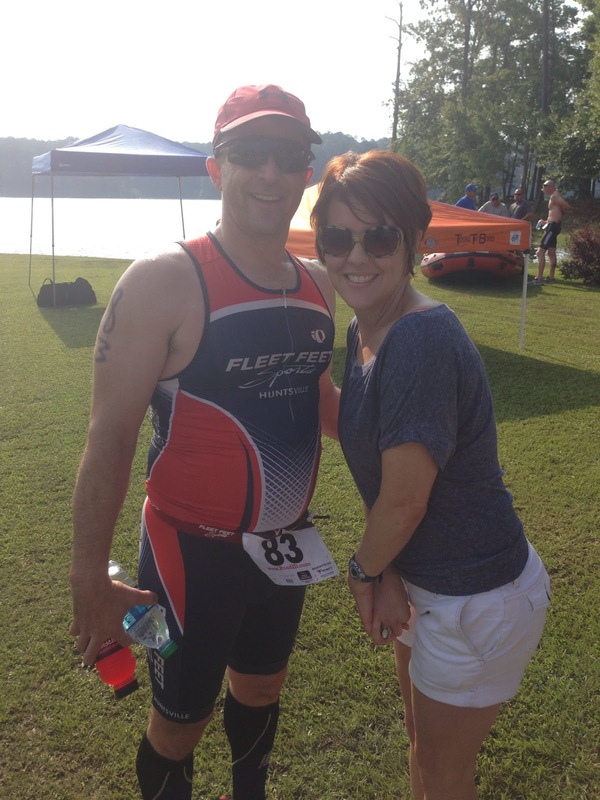 The Fleet Feet team put on a great showing and so did my many friends in the tri community. Congratulations to everyone that placed, and to everyone that PRed, and to everyone that had the courage to start and the fortitude to finish. I saw the athlete with only one leg on the bike leg. What an awesome testimony to the power of the human will. He reminds me that I need to stop making excuses and just get out there and race hard! 400m Swim, 15km Bike, 5km Run. So, pre-race routine was an experiment in what "not to do." the night before a race. After picking up my race packet on Friday, I went with the family to Point Mallard waterpark compliments of Alabama Pediatric Dental Associates. We left the water park around 9:00 pm and arrived back home at 9:30. Since I had not eaten dinner yet…pizza to the rescue. I polished off half of a large pizza around 10:30. Not exactly the time or the meal to expect great things from on race day. Race Day - Early wake up with the usual “superstition nutrition”. Picked up a friend and arrived at transition at 5:30. Grabbed a good spot on the bike rack, picked up my race bib, and went through all the normal set up routine. Took a short jog and then a warm up on the bike. Tried something a little different this time for the bike warm-up...I did three 1-minute intervals at approximately 90% RPE with 1-minute rest in between. Made it back to transition and hurried to the start line to barely make the team picture. I managed to snag Gregg on the way and used my "search" for him as my excuse for being a little late. 73°F and 93% Humidity, yeaaah, love this Alabama weather. Last thought before going in the water, "Why didn’t they play the National Anthem before the race?" SWIM – 6:43. Swim line up was a little hectic. Kinda, sorta by race number. IF the estimated swim times were accurate (they were not, judging by the number of "wet dogs" I had to pass) it would be nice to see the line-up order better enforced. I had estimated a 7:29 swim so I expected to pass a few people but not every 5 strokes. 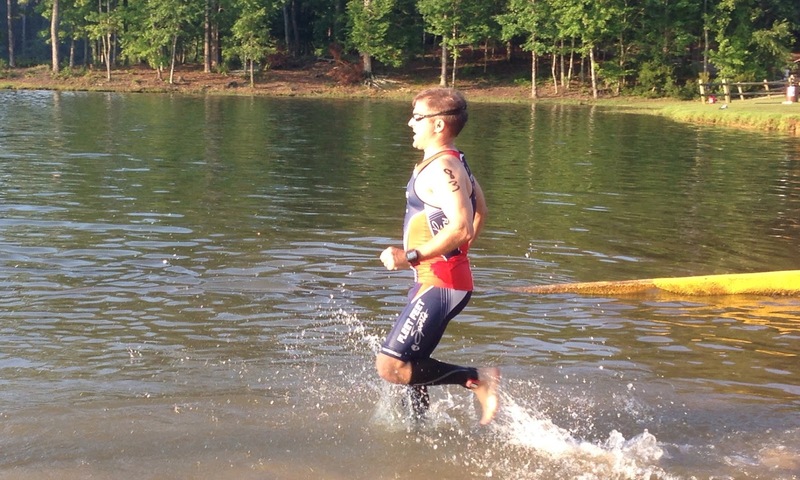 I wasn’t able to find a set of feet to follow this race and had to maneuver around a lot of other swimmers. 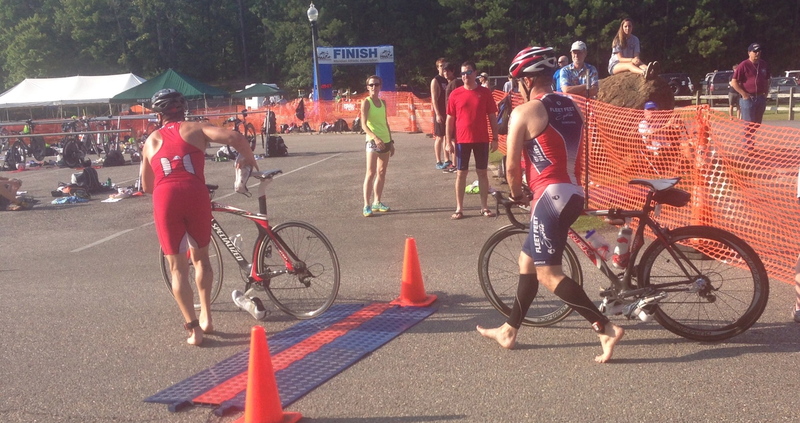 T1 – Other than the slow jog from the water to the bike, transition was smooth. 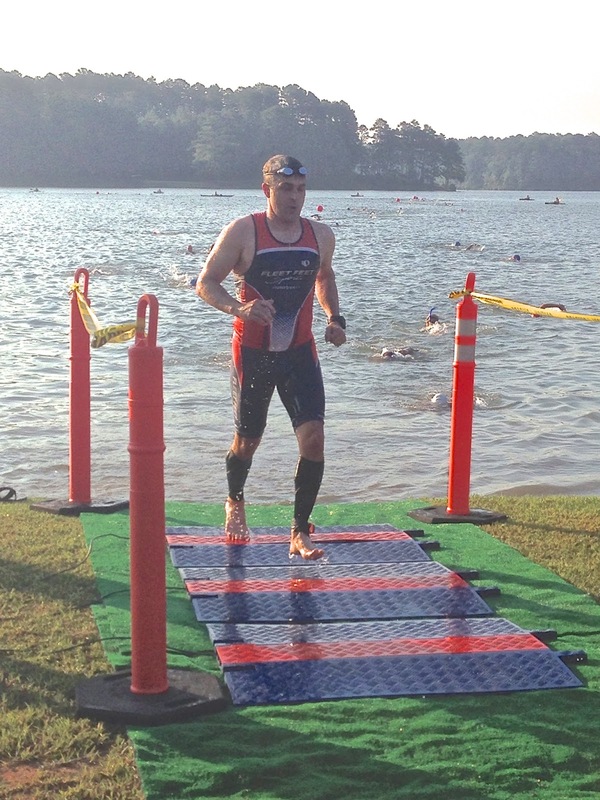 I came out of the water pretty winded and jogged through the gates and into transition. I got passed by a little kid who ran around me as I was jogging through the bike racks….youth, ha! BIKE – 23:45/22.7mph. The plan was to never let my speed get below 23mph on the bike. I averaged 21.2mph at last year’s Wet Dog. After getting my feet secure in my shoes without the shenanigans from my last race, and witnessing what was almost a nasty bike pile-up I was able to get to 23mph within the first minute. (Please, if you are trying to get your feet in your shoes just stay to the right side of the road and keep your wheel straight.) I kept the speed above 23mph and passed lots of disc wheels and tri-bikes (evil laugh). As I turned back into the park, I must’ve run out of gas. I couldn’t keep the speed up for the last mile and averaged 20mph coming back to the transition area. T2 – No problem on the dismount, but my legs were definitely feeling the effort on the bike. Almost collided with a volunteer who was “moseying” through transition as I tried to get to my bike rack. Checked my Garmin and heart rate was showing 179bpm. This is not where I want to be starting the run with the heart rate maxed out. Shoes, hat, glasses and I’m off, wondering how I’m going to get my heart rate to settle down. RUN – 24:18/7:52 pace. Goal was to run a 7:40 average pace. Started the run and immediately I knew I was going to pay for the fast bike time. My hamstrings felt like they were tied in knots. I had not drunk enough on the bike due to concentrating on keeping my speed up. So now I’m dry-mouthed and feeling a little overheated. I managed an 8:06 for mile 1. Water station must have been prepared early, but the water wasn’t cold enough to help cool me down. (side note: If only the sponsors would provide paper cups because it’s really hard to run and drink from a Styrofoam cup). The next mile was even worse at 8:17. I knew I had to make up time just to stay under 8 minute miles for the run. To make matters worse, at the turn-around point I kept going straight. Thank goodness there was a runner behind me. He whistled me back into consciousness telling me “Left!, Left!”. I was completely zoned out. Looped back and hit the water station and I must have woken up from there. I came out of my funk and knew I had to make up time. I turned in a 7:25 for mile 3 and sprinted through the finish line with a goofy photo op for Gregg Gelmis. 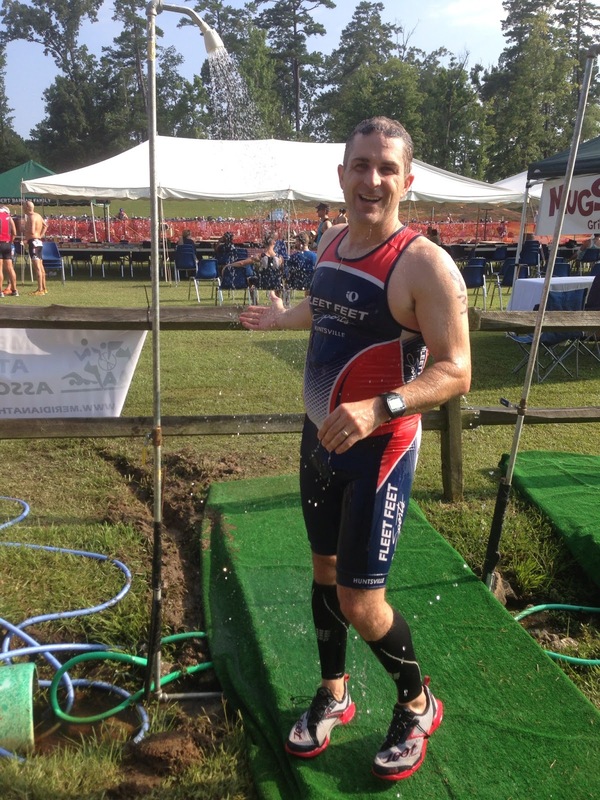 This was my 7th triathlon this year but the first repeat race from last season. Good to be able to compare and see some progress. I shaved 5:15 off of my total time and improved significantly on the bike and swim. I was 9th in my age group and 34th overall with a final time of 56:38. Hot and humid race day made the run a little more challenging than a 5K should be, despite the trail being mostly shaded. Colder water stations with paper cups would be nice, and I need to make sure and get more liquid down during the bike. More bike-run bricks will hopefully improve the first half of my run. Another good show of support for Big Brothers Big Sisters. Great race support on the course and great to see local athletes and volunteers making a difference in support of a worthy cause. 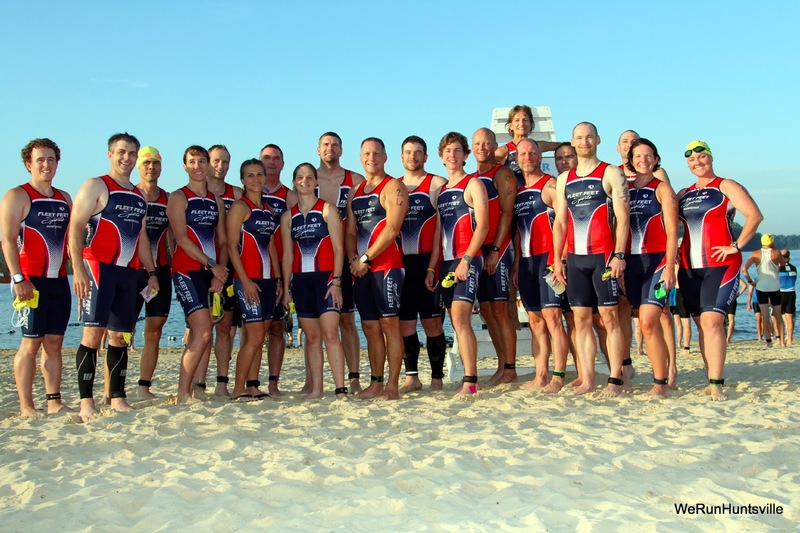 Lots of podium spots from the Fleet Feet Tri Team! Short plug for the CEP calf sleeves. 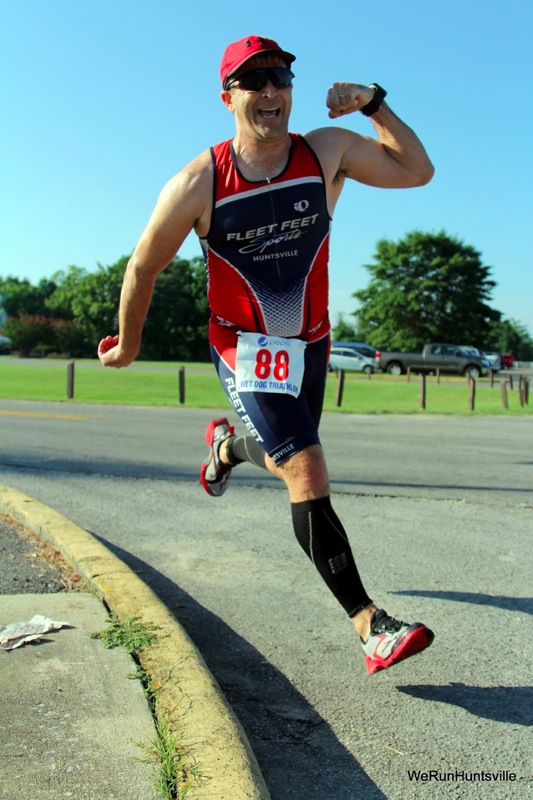 Foremost, all the cool triathletes wear them, just ask Rick Greif or Wes Johnson. Psychological or physiological, I couldn't say. If you read other reviews, you'll find the jury is still out, and maybe you should try a pair and make your own decision. You can wear them during the swim and they don't absorb enough water to notice. They claim to improve circulation and help prevent shin splints. I've had problems with shin splints in the past so maybe this is an ounce of prevention (compression IS a medically accepted treatment for shin splints). I have started wearing them this season and my run times are getting faster (and it's not because I'm training more for the run). They do help to keep your muscles more stable which should help conserve energy, and compression helps prevent your blood from collecting in the lower extremities during longer races. Science or pseudoscience? Stop by Fleet Feet Huntsville and give 'em a Tri. I drove up to Muncie, IN the day before the race. It took about 7 hrs to get there from Huntsville, checked in my hotel, then went straight to packet pick up and from there, went to check my bike in at transition. The bike check in was optional but I wanted to one less thing to worry about on race morning so I went ahead and checked it in the night before. I then went and got something to eat, took it back to the hotel and then went to bed. I got up at 4 am. Got my coffee in me and started getting ready. I like to get to the race site early and plus I didn’t know how jacked up parking was going to be. Ate my normal breakfast of oatmeal and a banana, got all my stuff together and then checked out of my hotel. I would be driving home as soon as the race is over. I drove down to the race site and parking wasn’t that bad. They had us parking in a field about a ¼ mile from transition. Got my transition bag and bike pump and headed down that way. I set up my transition stuff and headed down to the water for a little warm up. They were saying the water temperature was 75.5 degrees, which makes it wetsuit legal but when I got in the water it was very warm. 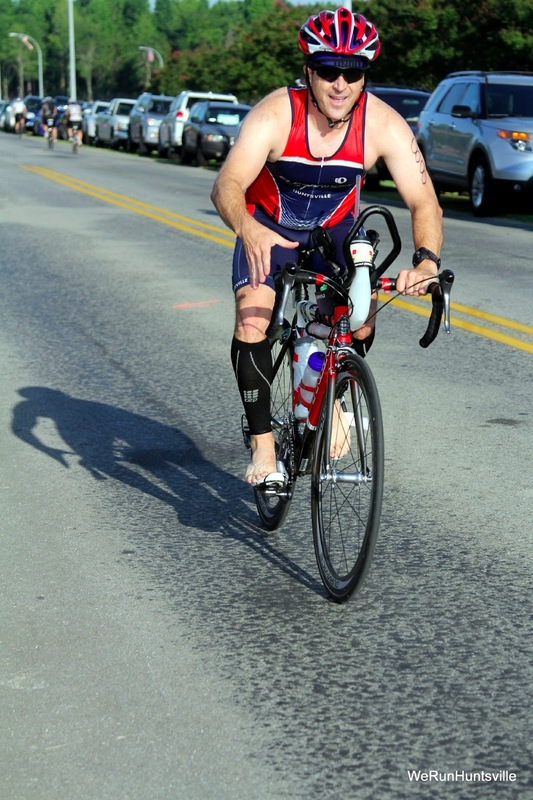 I opted not to wear a wetsuit because this race was to be a dry run for Ironman Louisville. My wave started at 7:35 am. Getting in the water was a little tricky because of all the rocks and for a tender footed person like myself, it was tricky. We stood in the shallow in and then the gun went off. You could almost walk to the 1st buoy. The water was fairly choppy but got worse as you went away from shore. The course is a rectangle making right turns. I thought I was doing fairly well until I made that last turn to come back to shore. The sun is right in your face. I had to stop and ask for directions twice because I couldn’t see where I was going. I finally made it to shore and ran up the hill to transition. I had my compression sleeves laid out and was going to use them for the bike but opted not to put them on because I was concerned about time. Put my shoes on, sunglasses, race belt, and helmet. Grabbed my bike and I was off. All I can say is this was a rough bike course. I should have brought a mountain bike it was so rough. The roads are in terrible condition. It’s an out and back. This course has a few rollers but nothing big. I was able to stay in the big chain ring the entire time. I had two bottles of Infinit on my bike along with my honey stinger waffles. During all the jarring due to the road conditions, my salt stick tablets fell out of my bento box somewhere along the way. After all that, I finally made it back to transition. Racked my bike, took off my helmet. Put on my socks and shoes, grabbed my fuel belt and my visor and I was off. Like the bike course, this course is an out and back. I felt pretty good starting out. My original plan was to run until I reached the aid stations, which were about every mile, and then walk the aid stations. I did that for the 1st couple and then I went to a ratio of 4 minutes of running to 1 minute of walking. After the turnaround at the halfway point my legs just wouldn’t go anymore. I tried to maintain my ratio of 4:1 but I was just trying to survive to make the cutoff. I’d like to do this race again to try to redeem myself and try to do better. The whole point of this was to try to boost my confidence for Louisville but it didn’t do that. 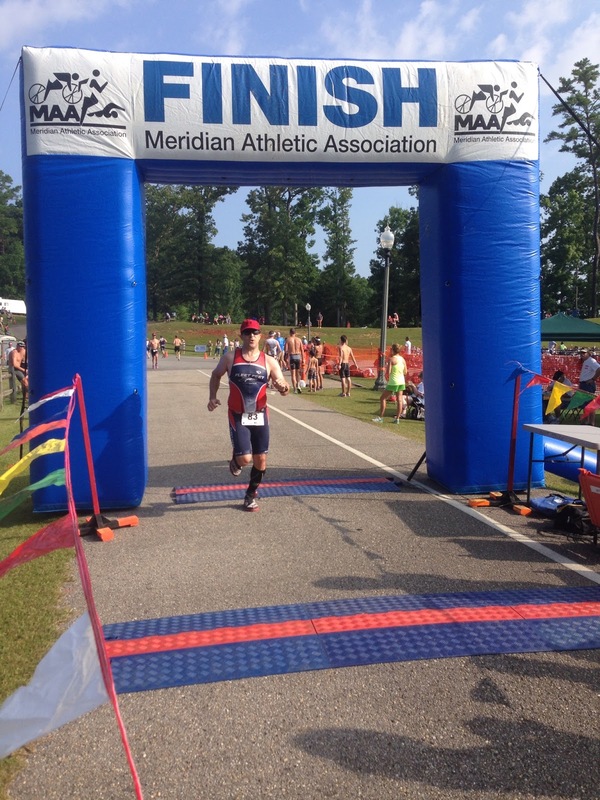 Sunfish Sprint Triathlon, Meridian, MS July 13th 2013. 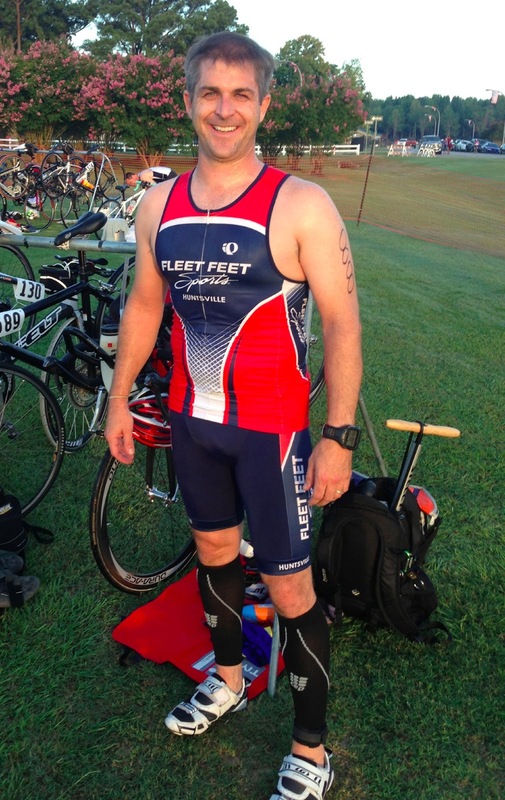 1/3 mile swim (586 yds)/17mi bike/5K run. Weather at start time: 70°, Sunny and 88% humidity and 5-7 mph northerly winds. I put this race on the calendar in coordination with a weekend trip to see family…what a coincidence. Left home and drove to Meridian on Friday afternoon. Picked up my race packet on the way into town (Bib #83) and got some takeout grilled seafood from Outback. Convenient to stay with family, but the guest bed is a double and we’re used to a king size mattress. I think my wife and I kept each other awake just due to lack of space and the “extra firm” (concrete) mattress. This resulted in almost no sleep the night before the race. After at best 2 hours of sleep, I followed my normal nutrition plan and headed back across town to the race. Got to the race site around 5:30 and set up my transition area on a rack about halfway between the corners that were designated as bike IN and bike OUT points. All along I felt like I was missing or forgetting something - very uncomfortable feeling for a new race course and and out of town race. Made a short jog around 6:20 to get the legs moving and then hopped on the bike for a test ride to check gearing and brakes. The bike mount line was right at the bottom of a short but significant “hill”. I made a couple of barefoot starts with my shoes clipped in to be sure that I could get up the hill without causing a crash or embarrassing myself. Racked the bike and then got to chat with my wife and Mom for a few minutes before lining up for the swim. With 2 young children my support crew usually opts to sleep in on race day. Nice change, since the kiddos were not with us, to see my wife right before the start. I can’t describe what a good feeling that it was to see her right before the race and again headed out for the run. Yes, triathlon is a mental sport. SWIM – 1/3 mile, 10:34. Different approach at this race to seed the starting order for the swim. It was a time trial start by bib number where race bibs were numbered based on registration order. As I line up for the swim, I’m thinking that despite being #83 in the water, there will be lots of swimmers to pass since it was based on registration order and not estimated swim time. I entered the water and within the first 50 yards another swimmer passed me. I decided that I would test the swim drafting theory and got right on his feet. I checked his sighting the first 25 yards or so and he was right on course, so I kept my head down and just followed his feet the rest of the swim. He stayed straight on course. I rolled into T1 feeling more rested than ever and my breathing and heart rate were completely under control. This was great! T1 - 0:40. Pretty smooth transition, and felt really fast (only 14 racers were faster!). Found out later that my wife took a photo as I exited the water, and by the time she made it to the bike mount line I was already pedaling away. Bike - 17 miles, 19.5 mph avg, 51:44. I made it up the hill pedaling barefoot on top of my shoes. As I reached the flat section crossing the lake dame, I attempted to slide my feet into my shoes. Left shoe slide in easy, but before I could Velcro the strap it came unclipped. Panic. Please don’t let me lose my shoe. Fixed that emergency and went to work on the right foot. The Velcro strap had came out of the metal loop. Fun time threading that back through while riding across the lake dam and not becoming a hazard to the other cyclists. 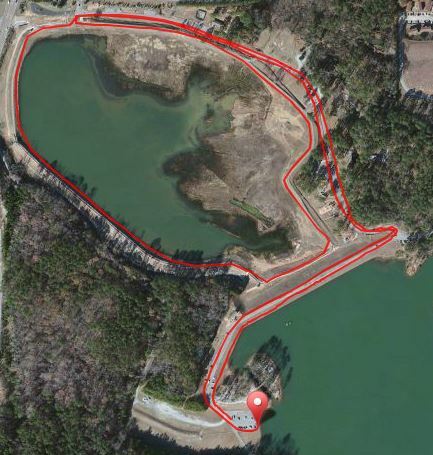 After finally getting all strapped into my bike, the course takes a nice steep downhill off the pond dam and I used it make up the seconds lost arguing with my shoes. Through the park and onto the highway and hello hill climb. I had ridden the course so it wasn’t a surprise, but still no fun hitting 3 hills about 100 feet/.25 mile each right out of the gate. Doesn’t seem like much on paper and I know some people enjoy it, but I’ll take the flat course any day. The rest of the bike went well. I did get passed by some really fast bikes, considering that there were plenty of fast racers behind me on the swim entry. Caught up with Rocketman on the course and noticed he was pulling another racer along (incidental drafting on her part I’m sure). The course did take a nice jaunt down a county road between miles 4 and 8 and thus began the Paris-Roubaix of Mississippi. This again, not a surprise, but the road was as bumpy as riding down cobblestone, only without the cobbles. On the upside, the local residents had taken care of the dozen plus dogs that chased me when I rode the course back in May. T2 - 0:44. No problem on the dismount and bike racking. Slid into my running shoes, grabbed my sunglasses, hat, and race belt and out the runner’s shoot. I usually clip my belt while standing in transition. Little things to save time… and putting on the hat, glasses, and belt while running out of transition does make a little time back (from my slow bike). Run - 5K, 23:36, 7:49 pace (Garmin recorded a 7:33 pace over 3.1 miles). Not sure why the 16 second difference between the race time and my Garmin? Run started out fast as I clocked a 7:19 on the first mile and wasn’t sure what to think. I knew I was running way too fast for my normal pace, so I slowed down for the second mile not wanting to bonk on a 5K. Lots of water stations in this race (3 stations, passing each one twice) and another first was getting an icewater sponge. Ice water sponges make for great heat relief under the hat. And it worked great on the back of my neck, too! Second mile came in at 7:44, more like it. Kept a steady pace through mile 3 and even pushed it up the hill back onto the lake dam. Picked up the pace the last 1/3 mile and finished strong at 1:27:13. Stepped off the course and under the showers just past the finish line. This was a nice touch that I would recommend to every race director. It helped to cool your body back down and was nice to rinse off the race sweat before heading to the food tent. Lots of good eats afterwards and shady spots under the tents with tables and chairs to enjoy the food. This was a small race but the USAT certification brought out some very fast racers in all age groups [James Bales- Air Force orthopedic surgeon, world class athlete and 2012 Olympic hopeful, Bain Foote - VP of Skin Sake, and first year pro triathlete and Sunfish 1st overall male Ben Hall, to mention a few]. That explains how there were 15 cyclists that averaged 23 MPH or better on a very hilly bike course. Parking was okay if you arrive early but they used all the space available and I even noticed some spectators had to park along the highway since they arrived after the race started. This meant over a mile walk to the finish line. Great venue overall and nice lake view with plenty of shade trees and even picnic tables on the hill overlooking the transition area. There were at least a dozen kayaks in the water for the swim course, lots of volunteers on the bike course, and as already mentioned, lots of water stations on the run. The ice water sponges and Finish Line showers were a huge hit in my opinion. Shout out to Rocketman’s daughter, Denise Joplin, for taking 1st Overall Female! !